Research is only starting to uncover the important role that fulvic minerals play and the information is amazing! 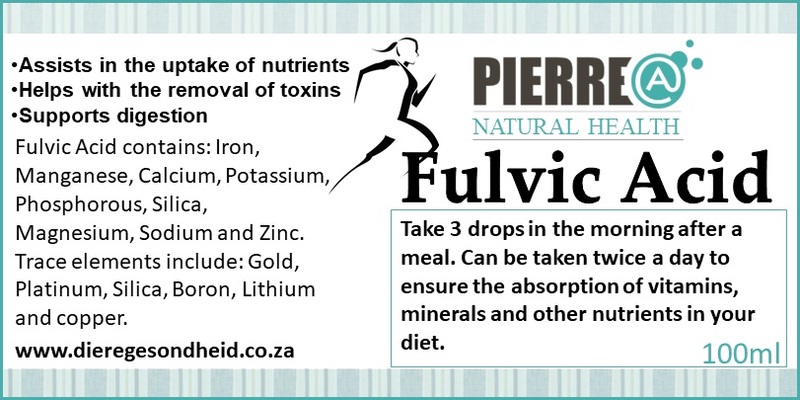 Fulvic acids support the body in a variety of ways including digestion, cell health, brain health and in the uptake of nutrients and the removal of toxins. Fulvic Acid contains: Iron, Manganese, Calcium, Potassium, Phosphorous, Silica, Magnesium, Sodium and Zinc. Trace elements include: Gold, Platinum, Silica, Boron, Lithium and copper. If you are pregnant, nursing, taking any medication or have a medical condition, please consult your healthcare practitioner before taking this product. Fulvic Acid may cause a reduction in blood pressure. Take 3 drops in the morning after a meal. Can be taken twice a day to ensure the absorption of vitamins, minerals and other nutrients in your diet.